The fate of Brooke Astor, the endearing philanthropist with the storied name, has generated worldwide headlines since her grandson Philip sued his father in 2006, alleging mistreatment of Brooke. And shortly after her death in 2007, Anthony Marshall, Mrs. Astor's only child, was indicted on charges of looting her estate. Rarely has there been a story with such an appealing heroine, conjuring up a world sonearly forgotten: a realm of lavish wealth and secrets of the sort that have engaged Americans from the era of Edith Wharton to the more recent days of Truman Capote and Vanity Fair.New York journalist Meryl Gordon has interviewed not only the elite of Brooke Astor's social circle but also the large staff who cosseted and cared for Mrs. Astor during her declining years. 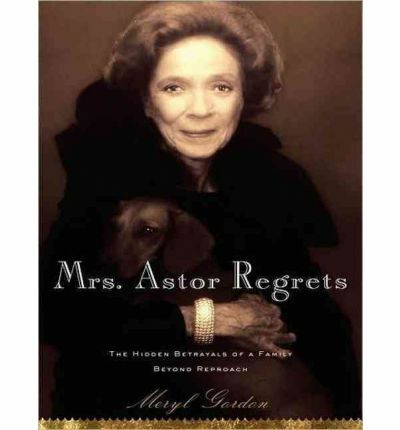 The result is the behind-the-headlines story of the Astor empire's unraveling, filled with never-before-reported scenes. This powerful, poignant saga takes the listener inside the gilded gates of an American dynasty to tell of three generations' worth of longing and missed opportunities. Even in this territory of privilege, no riches can put things right once they've been torn asunder. Here is an American epic of the bonds of money, morality, and social position. About the Author: MERYL GORDON is a full-time magazine journalist who for the past fifteen years has been a contract writer for New York magazine. She has profiled such influential figures as Kofi Annan, Mike Bloomberg, and John Kerry, and such stars as Nicole Kidman, Susan Sarandon, and Maggie Gyllenhaal. She has written major features for the New York Times Magazine, Gourmet, Elle,Marie Claire, and More. Earlier in her career she covered the police and courtbeats in Cincinnati and Rochester, and then became an economics writer inWashington, D.C. A graduate of the University of Michigan, she lives in New York City with her husband, Walter Shapiro, who is the Washingtonbureau chief for Salon.com.Raver is a versatile, classically trained actor who has made numerous stage appearances in New York, Los Angeles, and regional theaters around the country.